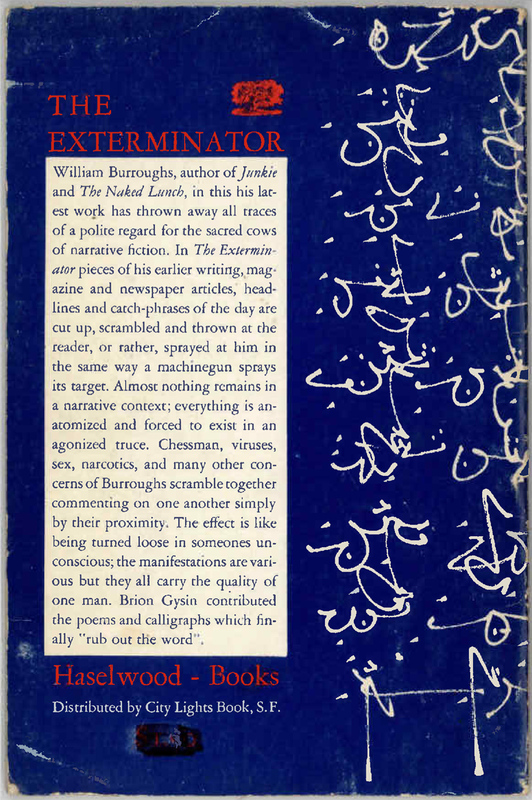 Published by Auerhahn Press in 1960, The Exterminator is one of the forgotten texts of Burroughs’ bibliography. Roughly 1000 copies were printed in the first edition, and I would gather that few of even the most dedicated Burroughs fans have ever read it. Many people get this slim volume confused with the more common Exterminator! Readers who go beyond Naked Lunch and Junkie are probably familiar with Exterminator! as the book is currently in print and often turns up at chain stores such as Borders. This makes sense as Exterminator! heralded Burroughs’ tentative steps into the world of mainstream publishing. The book was issued by Viking in 1973. Not surprisingly, this title is rather conservative in form, content, and packaging when compared to the radical experimentation in independent publishing venues of the preceding decade. It is basically a short story collection. If The Exterminator is a forgotten text, Dave Haselwood is something of a forgotten publisher. 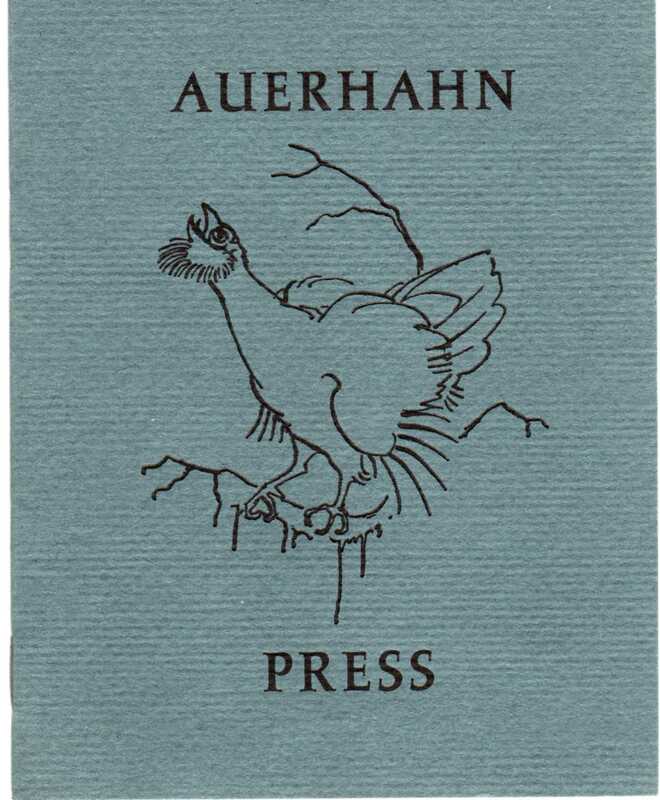 His Auerhahn Press aspired to join high-quality printing with experimental writing. Building on the solid foundations of Circle, Ark and the printing work of the refugees from the Waldport Camp, like William Everson, printing in San Francisco exploded after the so-called San Francisco Renaissance of the mid-1950s. Joe Dunn and later Graham Mackintosh ran White Rabbit Press. Robert Hawley began Oyez Press in 1963. A year later, Donald Allen started the Four Seasons Foundation. Little magazines, like Semina, Open Space and J Magazine flourished. In the late 1950s and early 1960s, Haselwood’s press was a shining light in this vibrant San Francisco publishing scene. His books were beautifully done and according to some expensive. Andrew Hoyem cut his teeth working with Haselwood on Auerhahn Press titles in 1961. Yet time has dimmed the glimmer of Auerhahn Press. Somehow printers, like Hoyem and Mackintosh, have become household names in printing circles, and the legacy of Haselwood gets relegated to the shadows, rarely to be seen or heard from, like the bird from which the press takes its name. How can this be possible when you take into consideration the titles and authors Haselwood published? Auerhahn began with John Wieners’ The Hotel Wentley Poems in 1958. Right off the bat the press printed a landmark work in post-WWII avant poetry. In addition, from the beginning Auerhahn had a signature look and feel. I love the cover photograph by Jerry Burchard. It reminds me of Charles Rotmil‘s cover of Bob Thompson for Kulchur 2. In fact, Haselwood had a way of publishing what became iconic cover images. This might be because Haselwood had the good sense to utilize the talents of Wallace Berman, Robert LaVigne and Bruce Conner. 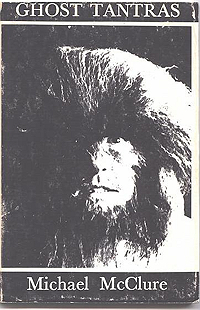 The covers of Michael McClure’s Ghost Tantras and Philip Lamantia’s Narcotica are amazing. 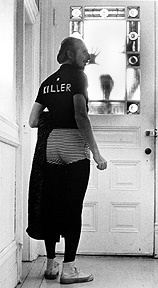 These are some of the most recognizable photos by Berman. If you didn’t get it for Christmas, get Wallace Berman’s Photographs. It came out late last year on the heels of the excellent Wallace Berman and his Circle. Do yourself a favor and get both. They are fantastic. In addition to multiple works by McClure and Lamantia, Haselwood also published books by Philip Whalen, Charles Olson, Lew Welch, Jack Spicer, and William Everson. After Auerhahn folded, Haselwood continued to publish wonderful titles under his own imprint, Dave Haselwood Books, including Apocalypse Rose by Charles Plymell and Indian Journals by Allen Ginsberg. Alastair Johnston of Poltroon Press has singlehandedly attempted to keep Haselwood and his incredible backlist in the spotlight. 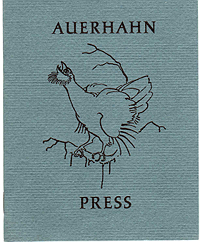 Johnston published a bibliography of Auerhahn Press in a beautiful edition. The look of the volume really does Haselwood and Johnston proud. The accompanying text is a treasure trove of information on Auerhahn. Go out and get a copy. While you are at it, pick up Poltroon’s White Rabbit Bibliography and the Zephyrus Image Bibliography as well. These are essential reference works on the San Francisco small press scene in the post-WWII era. If you can dig up a copy, get a hold of Ampersand Volume 16 Number 1 as well. In this issue entitled Beat: A Dead Horse, Johnston interviews the reclusive Haselwood. The quotes from interviews and letters that follow come from the bibliography and Ampersand. 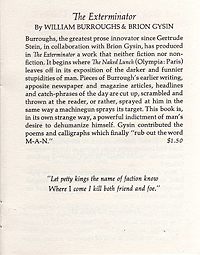 Burroughs and Gysin’s cut-up volume was the eighth book published by Auerhahn Press. Haselwood put a little extra into it. 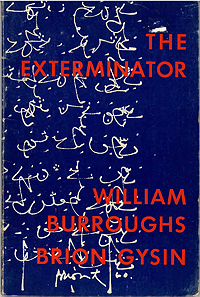 The Exterminator can be considered Burroughs’ first fine press edition. In fact a limited edition of the book contained original artwork by Gysin. Roughly octavo-size but thin (only 51 pages) the book has a slight, ethereal quality. This is highlighted by the beautiful wrappers inscribed with Brion Gysin calligraphy in light green on front and back. The white and green covers are delicate, subject to staining and fading. Finding a copy in fine condition is a challenge. On the other hand, Burroughs and Gysin were giddy with excitement about the possibilities of the cut-up. The collaborators saw nothing but opportunity and even dollar signs. Haselwood states, “[T]hey thought they would be very rich and famous. Can you imagine, from a cut-up book. God, he must have really been out on smack somewhere at that point. These are almost impossible to read. It was impossible to typeset.” I always find it funny that Burroughs thought his least commercial writing was a potential moneymaker. 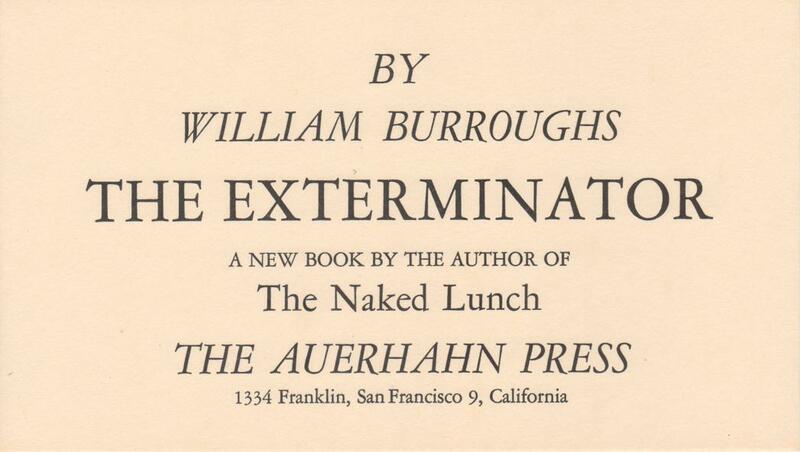 Burroughs believed The Exterminator would “catch on commercially” and wondered if Auerhahn could handle it. Burroughs writes, “Do you have any connections with recording? Brion and I have both made tape recordings of material in Exterminator I and II. In fact, the repetitive poems could be jukebox sensation.” He thought they would be great on the radio. As evidenced from the collected letters, Burroughs early on desired to be a bestselling author. He craved acceptance from an audience, be it the general public or, as Oliver Harris demonstrated, Ginsberg or Lewis Marker. This early need for affirmation and the desire to make it big never left Burroughs. These attitudes make Burroughs’ decision to do a Nike ad in 1994 perfectly understandable to me. From the beginning, Burroughs sought to sell out. On one level he never had the opportunity early on. On another level, no matter how hard he tried (and the letters show he tried repeatedly); he just could not write bestseller material. The Ugly Spirit kept getting in the way, as did his faith in the cut-ups. But like his grandfather, Burroughs was an entrepreneur. He wanted to make a buck. It was in his blood. Exterminator fever did not sweep the country although Burroughs received a small royalty check from Haselwood in 1961. Yet the book must have been something of a success, because Haselwood reissued it in 1967 with much less beautiful wrappers. Missing are the white and green, replaced by a dark blue and red. In my opinion, the color change makes all the difference. Like the 1960 edition, there were 1000 copies in the second edition. So what does this forgotten text tell us? 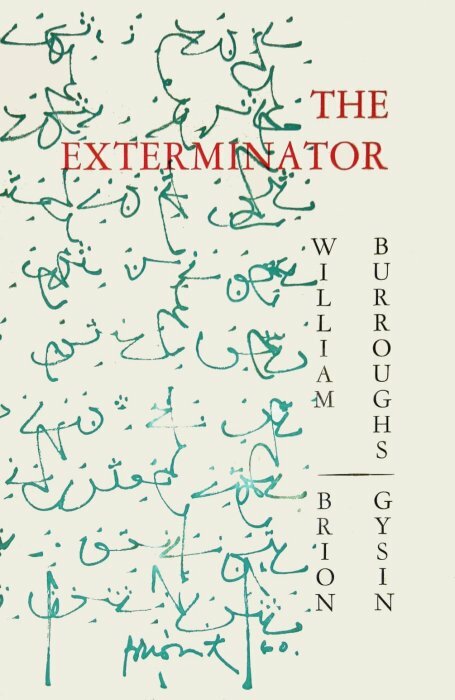 The Exterminator presents Burroughs at the dawn of his most radically experimental period. The idea of Burroughs as a poet has largely gone unnoticed. This may be due to the rarity of the two key texts in question: Minutes to Go and The Exterminator. But in the time between the Olympia Naked Lunch and the Olympia Soft Machine (late 1959 to mid 1961), Burroughs appeared before the public as much as a poet then as a novelist. Remember Naked Lunch was unavailable in the United States as a complete novel. It remained in essence a short story published in little magazines like Big Table. 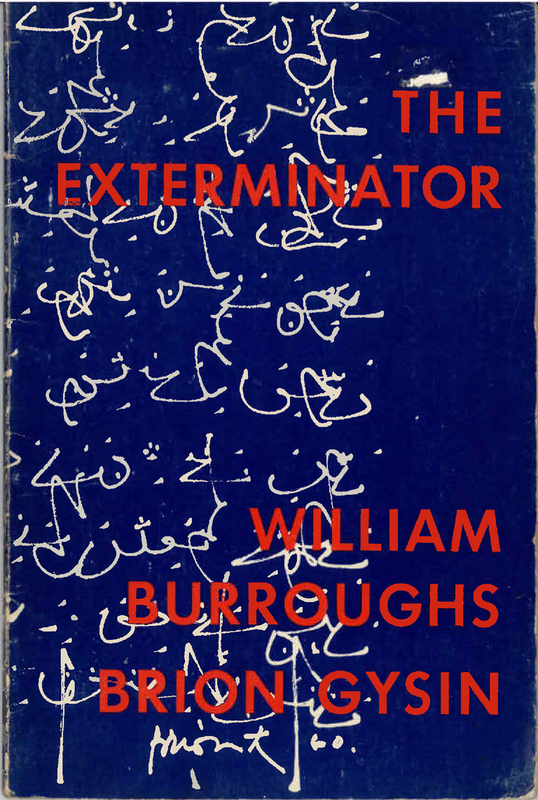 In fact, The Exterminator was Burroughs’ first book in the United States since the 1953 Ace edition of Junkie. 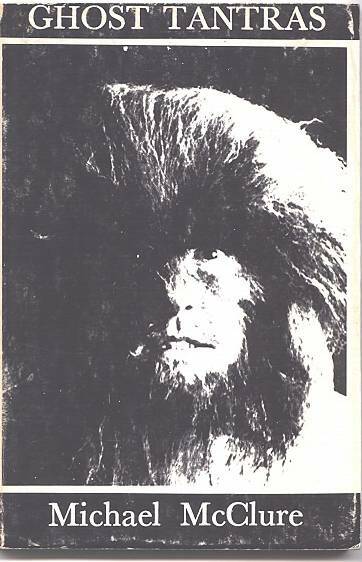 In the little magazine scene, Burroughs the poet is most obviously present in Semina IV, Locus Solus II, and Floating Bear 24. These publications had few readers, but those who received them were probably writers and artists. The Burroughs they would be familiar with would be as much a poet as a novelist. This may helps explain his appeal to, and presence in the publications by, First and Second Generation New Yorkers such as John Ashbery and Ted Berrigan. Of course, the poetic elements of Burroughs are beautifully apparent in Naked Lunch, and Burroughs’ interest and mastery of poetry continues into the visual (scrapbooks, three columns) and textual (the novels and shorter prose poems) cut-ups of the mid-1960s. The Exterminator is a mixture of fiction, essay and poetry. Burroughs described it as a “cosmic opera. Like Gotterdamerung” with themes of junk, viruses and Caryl Chessman. To put a spin on Haselwood’s view, it is a glorious mess of several genres. The Exterminator serves as a transitional work from the poetic experiments of Minutes to Go to the form of the novel in the Soft Machine. It is also the foundation for the more ambitious cut-up works like APO-33, Time, The Third Mind, and The Dead Star. I feel that Burroughs and Gysin’s contributions really mesh well together in The Exterminator. I am reminded of the tagline to Cronenberg’s Naked Lunch — “Exterminate all rational thought.” This thin book seeks to shatter the control of the Word. The book opens, “The Human Being are strung lines of word associates that control ‘thoughts feelings and apparent sensory impressions.’ Quote from Encephalographic Research Chicago Written in TIME. See Page 156 Naked Lunch Burroughs. See and hear what They expect to see and hear because The Word Lines keep Thee in Slots..” Gysin’s permutation poems “Rub Out the Words” and “In the Beginning was the Word” fit in beautifully here as do his drawings that close the book. Burroughs’ interest in the possibilities of glyphs and hieroglyphics (like Pound’s with ideograms or Olson with the Mayans) as alternative forms of communication and representation becomes apparent here. Burroughs would return to this effect at the end of Olympia Press edition of The Ticket That Exploded where that book ends in silence represented by Gysin’s poem morphing into calligraphy (“Silence to say Goodbye”). From the instant of its rediscovery by Gysin in September 1959, the cut-up technique was in a state of constant flux and rapid development. The work of Minutes to Go quickly overflowed and morphed into the work collected in The Exterminator. 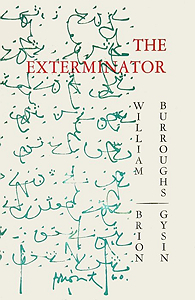 Like mercury, the material in The Exterminator refused to remain under Burroughs’ authorial control. The material kept coming and spilled into a possible second volume. Despite Burroughs’ optimism, The Exterminator was destined to be a one-shot deal. Burroughs described The Exterminator as “Pure abstract literature.” Reading it now, the book feels remarkably current and fresh, like some of the experimental writing published today in the small press scene. Not surprisingly the cut-up technique is a major tool in the avant poet’s toolbox. Oliver Harris points out or suggests much of this in an article in Edinburgh Review Issue 114: “Burroughs is a poet too, really’: The Poetics of Minutes to Go. 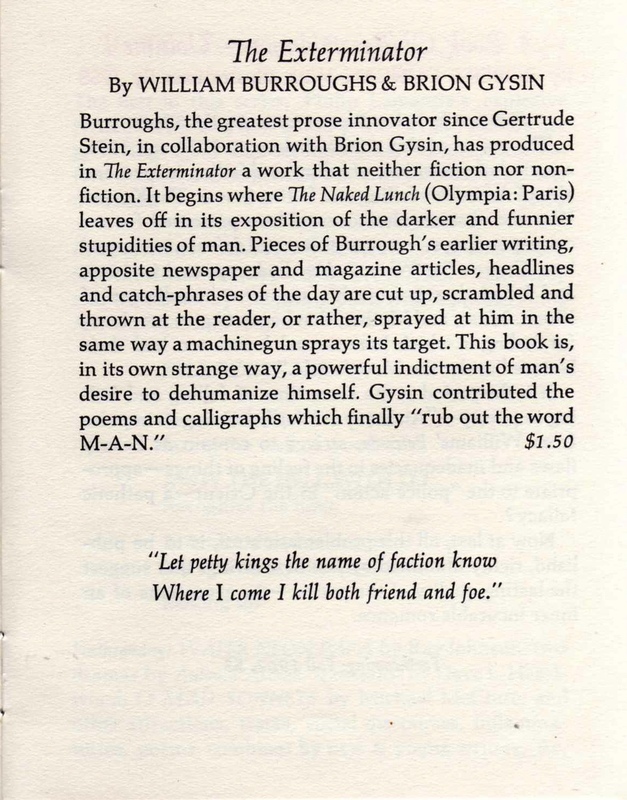 “ The quote on Burroughs as a poet comes from the 1966 Paris Review interview with Allen Ginsberg. Interestingly, Harris barely mentions The Exterminator. Not too surprising given the confusingly hybrid nature of the book and the more traditionally “poetic” sources, form, and content of Minutes to Go. Clearly, The Exterminator is in danger of becoming a lost work. Too bad in my opinion. In the next few weeks or so, The Hermitage in Beacon NY is having an exhibition on Auerhahn Press at its space. A copy of The Exterminator might be on display. I do know he has some rare Auerhahn broadsides, so get up to Beacon if you are in the area.